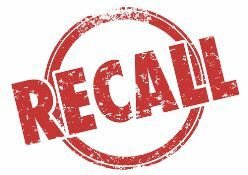 According to recently released data from the National Highway Traffic Safety Administration (NHTSA), over 51 million vehicles were indicated in a recall last year. With an estimated 253 million cars on the road, the figure represents a 20 percent chance that a consumer who owns just one vehicle could be driving a defective product. In recent years, the NHTSA has taken steps to improve its identification of auto defects and the notification of consumers. This month, the Safe Cars Save Lives awareness program was launched. The program encourages car owners to routinely check for active recalls. General Motors ignition switch. A faulty ignition switch cuts power to some vehicles, including the power to the airbag system. The defect allegedly caused 120 deaths. Toyota gas pedal. The gas pedal could stick, causing the car to accelerate randomly and leading to dangerous crashes and a number of deaths. Chrysler Jeep fuel tank. A poorly designed fuel tank left vehicles susceptible to catching fire. This resulted in more than 50 deaths. Takata airbag. One of the largest and most recent recalls, faulty inflators caused the airbags to deploy explosively. Ten different automakers used the company’s airbags, which were responsible for nine U.S. fatalities. In 2015, the NHTSA estimates that nearly a quarter of the 51 million recalled vehicles did not get repaired. Part of the problem, the group suggests, is that consumers simply don’t know about the recall. To increase awareness, the Safe Cars Save Lives campaign was launched, offering a number of safety videos and online ads. Officials are encouraging consumers to use their vehicle identification number (VIN) to check for open recalls twice a year. Additionally, the NHTSA issued an Advance Notice of Proposed Rulemaking (ANPRM) seeking further ways to notify the public of new recalls. Currently, mailings are sent to the owners associated with the VIN numbers on each recall. Though safety groups have improved efforts to notify the public and rectify dangerous vehicle issues, defective products do make their way onto the market. If you or someone you love has suffered injuries in an accident due to a defective car part, you may be eligible to file a claim. Fill out our online contact form and have a member of the experienced team at the Tapella & Eberspacher Law Firm answer your questions today.